BEFORE: Glengarry Glen Ross is the film du jour. Alec Baldwin carries over from yesterday and some familiar faces to the marathon return including Al Pacino (last seen in Donnie Brasco) and Kevin Spacey (last seen in The Big Kahuna). Before Phil gives his speech at the end, there was nothing entertaining about this film. It’s a slow-moving, theological, question machine. A lot of the same is true for Glengarry Glen Ross as well. The film is very slow moving and relies almost entirely on dialogue with little to no visuals. One of the most important “rules” you learn about writing a screenplay is it should be 60/40 action to dialogue. In other words, the majority of the film should be explained visually instead of though exposition. I put rules in quotation marks because it’s not a law; you can break the 60/40 rule and still get good results. But anytime you have more dialogue than action, it’s harder for the viewer to pay attention to what is going on. When things are visual, the viewer must actively concentrate on the film. If it’s just dialogue, your eyes and mind can wander somewhere else and you don’t need to devote your full attention to what is going on. Glengarry Glen Ross had some fantastic dialogue, but it is overshadowed by the other garbage. Maybe the reason I’m not a big fan of the film is that I’m not a big fan of plays. I’m aware many people are a fan of that medium but it’s just not something that appeals to me. 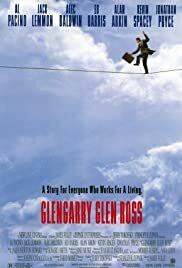 Glengarry Glen Ross comes across to me as a taped play instead of a film. If that sounds entertaining to you, go ahead and watch it, but it’s low on the totem pole for me.